Are you trying to determine which of the types of commercial concrete foundations will be ideal for your steel building? It’s an important consideration because the foundation is literally the support of the building. The right foundation will resist the loads from the building as well as loads from the climate, which means your steel building will be more durable and stand stronger for longer. When designing a steel building foundation, building engineers will provide the requirements and guidelines necessary for the loading and anchor bolts. This information enables the foundation engineers to make sure the foundation is sufficient to support the building. The excavation process of the foundation area will depend on the type of foundation the builder chooses to use. While a shallow excavation is possible by hand, deep excavation for foundations measuring over three inches typically requires the use of heavy, professional construction equipment. Footing design, also known as T-shaped footing, is the foundation style that involves the installation of spread footings under each of the columns of the steel building. The footings are installed just below the frost line, and the pilasters stretch to the bottom of each column. A continuous wall or beam connects the pilasters and footing around the perimeter of the building. Then, concrete fills the space between the beams. In addition to these two foundation designs, you will also need to choose the right foundation type. The wrong foundation type can mean a weak base for your building, so it is important to have professional assistance as you choose the right foundation. Floating slabs: a foundation with one continuous grade that features reinforcement at the bottom or spreads under the steel columns. Footing and grade beams: a foundation with rectangular and square footings that get their support from grade beams. Drilled piers: a foundation that has vertical piers instead of footings; these piers are a result of deep holes that the foundation professionals drilled into the ground. The moment you decide on the foundation type you will use for your commercial steel building will impact the future of your business. If you want a long-lasting, durable steel building for your commercial purposes, get the professional help you need to make the right choice for your building’s foundation. This is an area where you simply cannot cut corners or wing it. The good news is our team at Peak Steel is ready to help you get the job done right. We know foundations and fully understand how vital a strong, well-built foundation is to your commercial steel building. Come to us with your questions and get the answers you need so you can feel confident moving forward with your foundation choice. We will work closely with you to streamline the entire process–from choosing your foundation type to ensuring your foundation is 100% ready for your steel building placement. You can be sure our team of experts will take your commercial building project seriously. We want you to be able to look back on the foundation and building process as a positive experience that resulted in the success of your business. Our team knows satisfied customers will pass on our name to new customers; we work hard to earn your trust and respect. Peak Steel Buildings is only happy with the job when you are. 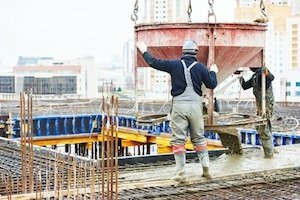 Which of the Types of Foundations Is Right for Your Steel Building? What works for one building may not work for the other; come to Peak Steel Buildings to figure out which type of foundation is ideal for your unique business building. We will carefully assess your steel building plans, business goals, and budget to help you map out a smart plan for a successful building completion. You will also be pleased to find online tools on our website to guide you in the planning and design process. We try to make the experience as hassle-free and enjoyable as possible. Visit us online to learn more about how to plan for commercial concrete foundations for your steel building today. What’s the AISC Standard for Steel Building Structures and Why Does it Matter?